Respecting heritage, affecting change in a country’s health system: Papua New Guinea is a rich island nation with intact forest and reef all around. More than 90 percent of the land is owned by indigenous communities and administered with their customs. 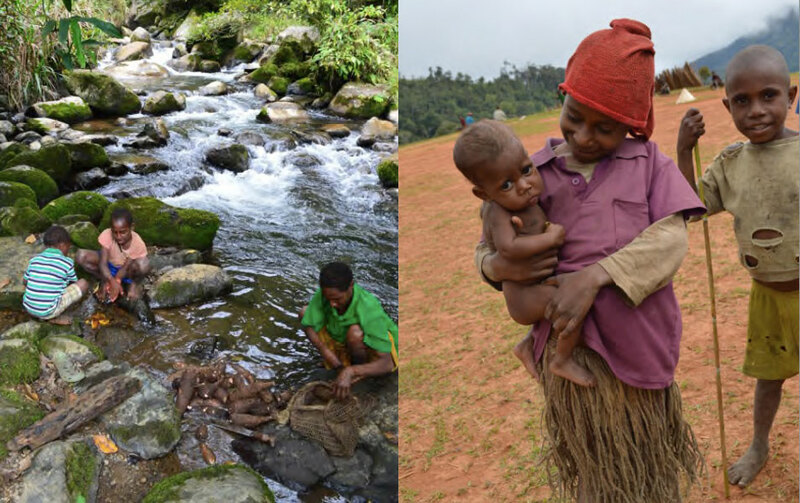 The locals, such as those in the Souwi Valley, typically rely on the sea and land for fishing and hunting. Until 2002, due to the remoteness of their villages, many of the valley people were denied much-needed health, education and development projects. Research assistant, Ben Ruli, Interviewing woman with onlookers. Typical mumu steamed starch meal for the entire family and visitors. Left: Hand and taro washing in river. Right: Chronically ill two-year old baby. 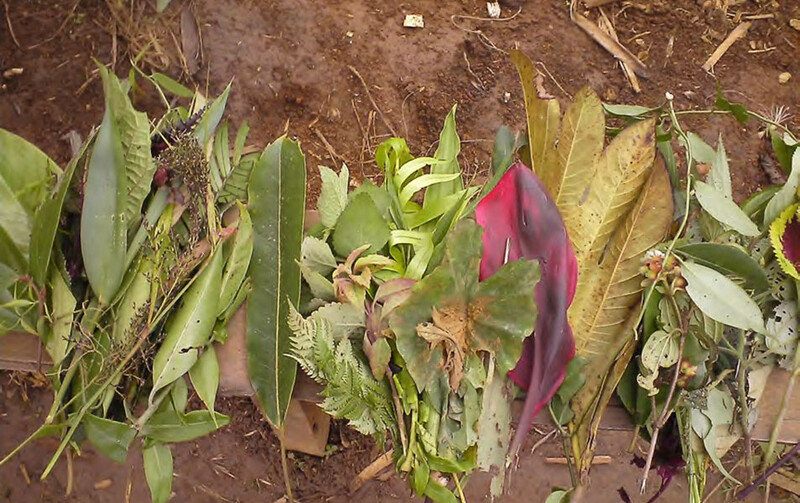 Medicinal plants gathered by traditional healers. 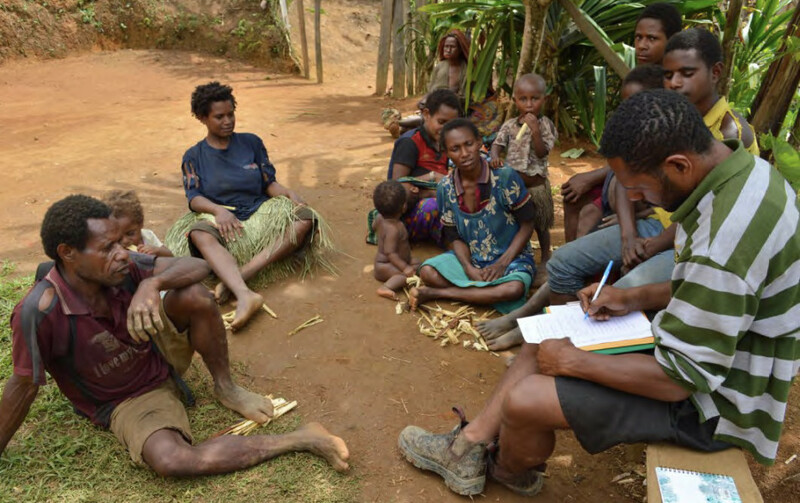 In 2015, the Wildlife Conservation Society and the Research Conservation Foundation of Papua New Guinea, organizations specializing in culturally centered conservation education, were brought in to identify the country’s most pressing health issues and develop solutions. * Focusing on the remote communities of Gulf Province, the project staff, led by anthropologist and DefCult collaborator Shannon Randolph, incorporated user-centric design methods in their work to find solutions. A critical issue among members of the population of Souwi Valley was the rate of tropical ulcers and diarrheal diseases that were killing people unnecessarily. Through interviews with those living in small villages across the valley, the researchers learned that hygiene was not part of the culture, apart from Sundays, when they went to church. Water was not accessible in homes and, more importantly, was withheld for important cultural reasons. To affect change that could ultimately save lives, the team realized any solution must respect and incorporate ingrained customs. Ultimately, a two-pronged initiative was developed that focused on instilling new cleaning rituals with and without water. The team worked with schoolchildren to craft songs that communicated a new tradition of splashing clean in the stream, every time you crossed water. 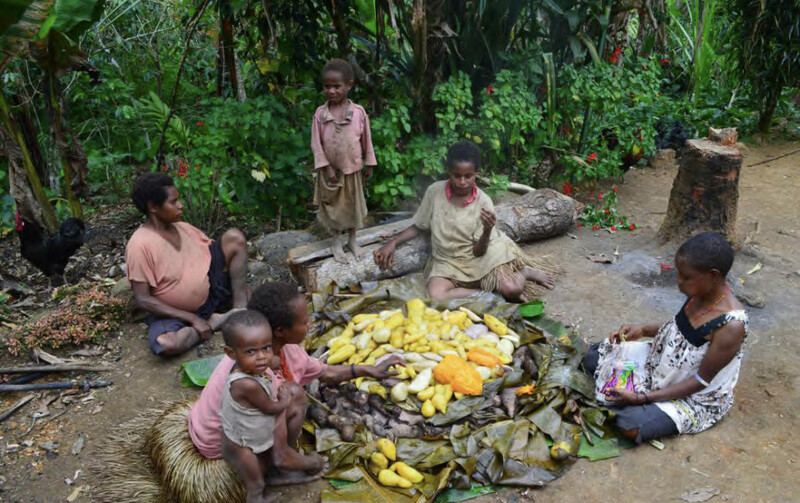 They also identified culturally acceptable alternatives to washing such as using fresh leaves near the house to rub hands clean before eating. Including cultural heritage in these initiatives was critical to ensuring the Souwi Valley people would respond openly to suggested changes to ingrained customs. With that in mind, the team worked in partnership with a local organization to craft new school curricula that incorporated important uses of water, flora and wildlife. This project is currently in process. *A part of the overall work for which the organizations were engaged.